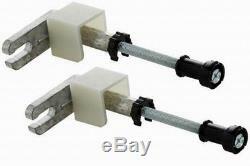 GEBERIT DUOFIX 98CM OMEGA 3in1 WALL HUNG WC TOILET FRAME CISTERN +BRACKETS +MAT. The Geberit Duofix Omega H98 is a pre-plumbed WC frame that provides the flexibility to install the WC in small or awkwardly shaped bathrooms. With a low installation height of 98cm. Depending on the construction situation, the flush plate can be attached to the top or front of the cistern. With no special tools required to install the cistern or the flush plate. This ensures that fitting time and disruption are kept to an absolute minimum on all projects. The Geberit Duofix Omega H98 111.031.00.1 Features. 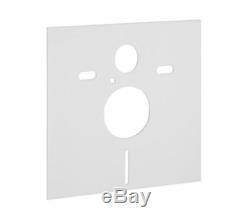 · For installation in part or full height room installations. · With front and top access to cistern. · Concealed cistern with top or front actuation. · With wall fixing brackets. · With 90 degree drainage bend. · With conduit pipe for connection to Geberit AquaClean. · Easy to clean coating on glass and metal. 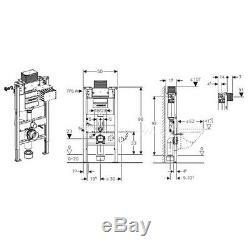 · Immediate post flush possible with factory setting. · Tool-free installation and maintenance work on concealed cistern. · Water supply connection, rear or top centre. 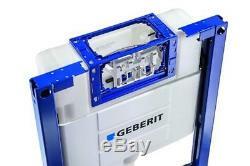 · Protection cover box for service opening protects against moisture and dirt. 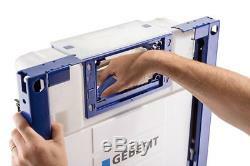 · Protection box for service opening can be cut to length. 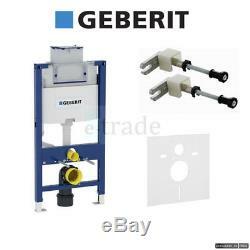 · Equipped with conduit pipe for feed pipe for connection of Geberit AquaClean shower toilets. 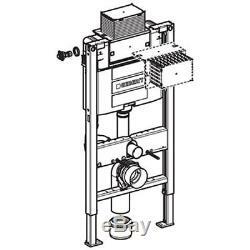 · Wall fixture variable from 30 - 60 degrees. · Maximum operating temperature, water 25 °C. · Flush volume, factory setting is 5.8 and 3 l. · Flush volume small adjustment range is 3-4 l. · Comes with an extensive 25 year guarantee from Geberit. If you need more quantities than listed, please get in touch and this will be arranged. The courier services are outsourced from courier company, therefore we can't guarantee that the order will definitely be delivered in the specified time. We issue VAT invoices with VAT stated separately. With E-Trade you have 30 days to change your mind and return the item. Just write to us to inform us about it, so we confirm the address. Or call: 7494 22 66 00. Feedback after receipt of your order would be very much appreciated -THANK YOU. WATCH A VIDEO SHOWING HOW TO INSTALL A DUOFIX FRAME. Should you need an invoice with VAT stated separately, please get in touch or add a note to your order at the check-out. For standard post of 1st Class you should allow between 1-3 days despite the estimated date. Every listing has various postal options from Signed for, Tracked 24H courier or Next Day by 10:30 (at additional cost if needed) for your convenience. You will have to cover the cost of posting the product back to us. Any product you return must be in the same condition you received it and in the original packaging with all labels that it came with. Any claims for short deliveries, damaged goods or incorrect items must be advised within 3 days of the receipt of goods. Under no circumstances we will be liable for any loss, damages or remedial expenses whether or consequently arising from the goods supplied for any purpose. Please be aware it is your responsibility to check the product detail and item specifics where the information is provided. 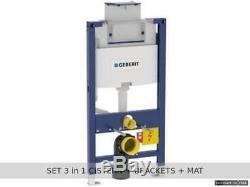 If in doubt please get in touch befroe placing the order. While we endavour to ensure that the product info and specs are correct, we do not warrant the accuracy of the material on the listings. Producer specs can alter at any time and we endavour to note these changes but cannot be held responsible for alterations beyond our control. GEBERIT Duofix Omega H98 The Geberit Duofix Omega H98 is a pre-plumbed WC frame that provides the flexibility to install the WC in small or awkwardly shaped bathrooms, with a low installation height of 98cm. Depending on the construction situation, the flush plate can be attached to the top or front of the cistern, with no special tools required to install the cistern or the flush plate. Com or call: 7494 226600 Feedback after receipt of your order would be very much appreciated -THANK YOU. The item "GEBERIT DUOFIX 98CM OMEGA 3in1 WALL HUNG WC TOILET FRAME CISTERN +BRACKETS +MAT" is in sale since Friday, April 28, 2017. This item is in the category "Home, Furniture & DIY\Bath\Toilets & Bidets\Toilets". The seller is "e-tradebestsela" and is located in Partridge Green, Horsham.